You can make face masks with ingredients in your pantry rather than spending money on chemical-laden products that may, or may not, work for your unique skin. With homemade recipes you can adjust levels of ingredients, or swap them out entirely until it’s perfect. Also, when a recipe fails, you can eat it. When you lay down on your bed with the mask on, lay a towel down to protect your sheets from stains. 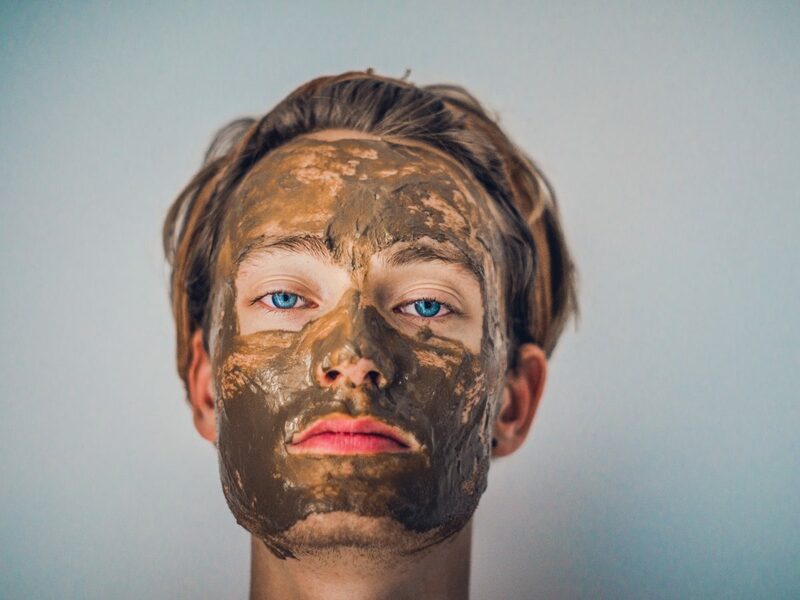 Most masks should only be left on for a matter of minutes and then rinsed off so you won’t have to worry about rolling over in your sleep and ruining the mask or your sheets at the same time. Extra portions of the mask can be stored in the refrigerator for later use. Separate 2 egg whites and put them in a bowl. Mix the egg whites with 2 tablespoons of yogurt. Leave on the face for a few minutes. Rinse with warm water and follow with a warm washcloth. Blend 1 egg white, 2 tablespoons of bentonite clay, 1 tablespoon of corn flour, and a drop of your choice of essential oil. Apply to face and lie down. Wash off with a warm cloth. Mix 1 egg white, ½ tablespoon of oil (olive, almond, or coconut), 1 tablespoon of flour, 1 teaspoon of brown sugar, and 1 tablespoon of whole milk. Finish with a moisturizer to lock in all the oils. Beat 1 very cold egg white with 1 teaspoon of cornstarch. It should become frothy and well blended with no lumps. Smooth it on the skin (it should feel like gel) and lie down to let it dry. Rinse it off and finish with a moisturizer. Mash a ripe banana with 2 tablespoons of honey and 1 teaspoon of citrus (lemon or orange juice). Apply to face and let sit for 15 minutes. Rinse off and then pat with a steaming hot wash cloth. Mix 1 egg white, 2 tablespoons of warm honey, 4 teaspoons of lemon juice, and 3 teaspoons of yogurt. Apply to face and leave on for 15 minutes before you wash it off. Mix 1 teaspoon of apple cider vinegar, 2 teaspoons of cooled green tea, 5 teaspoons of sugar, and 1 teaspoon of honey. Spread on your face with cotton pad and massage. Leave the mask on for about 10 minutes and rinse with water. Mix 1 teaspoon of cinnamon and 2 tablespoons of honey. Slather it on with your fingers. Leave it on for between 10 and 15 minutes. Rinse it off with warm water and then use a toner (a toner can be as simple as 1 part apple cider vinegar to 2 parts water). Mash ½ a ripe avocado with ¼ cup honey. Apply to skin and leave on for 10 minutes. Rinse with a cool wash cloth. Peel and de-stem 1 carrot and then steam or boil it until it’s fork tender. Mash the carrot with ½ an avocado, 1 tablespoon of honey, ½ tablespoon oil, and 1 egg yolk. Spread over a clean face and let it sit for 15 minutes. Wash it off with a warm washcloth and pat dry with a towel. Mash ¼ of a ripe avocado, 1 tablespoon of buttermilk or heavy cream, and a sprinkle of cornstarch together. Smooth across skin, let sit for 15 minutes, and rinse off. Mix 1 tablespoon of avocado oil with 1 tablespoon of brown sugar. Massage it onto the face in a circular motion. Enjoy smoother, softer, brighter, healthier skin while being creative.